Nottingham Trent University and the RSA (Royal Society for the Encouragement of Arts, Manufactures and Commerce) are pleased to welcome Katie Biggerstaff and Harry Cooke, second year Nottingham Business School students, to an exciting research project over the summer. Katie Biggerstaff says "I can’t wait to take part in this opportunity which has the potential to spread awareness of the inner workings of household cost indices to a wider group; in order to hopefully address economic insecurities and improve inequality for those on the breadline." A university supported research bursary provides the opportunity for students like Katie and Harry to develop their transferable skills, test their academic learning and build experiences that will support them once they have completed their studies. From the start of July, these two students will be spending five weeks developing a toolkit and key messages based on a new Office for National Statistics (ONS) inflation and Household Cost Indices. We hope that this new data can be used to develop a debate about the value of using one single average basket of goods used by the Consumer Price Index inflation measure. Supported by Nottingham Trent University staff and the RSA both students will explore how this new data can be understood and used by key stakeholders. The creation of a new tool to be used by policymakers and the public will help highlight the challenge of using a single inflation rate and will open up the debate on living standards for differing groups. The people for whom inflation is most serious are those with high levels of economic insecurity. 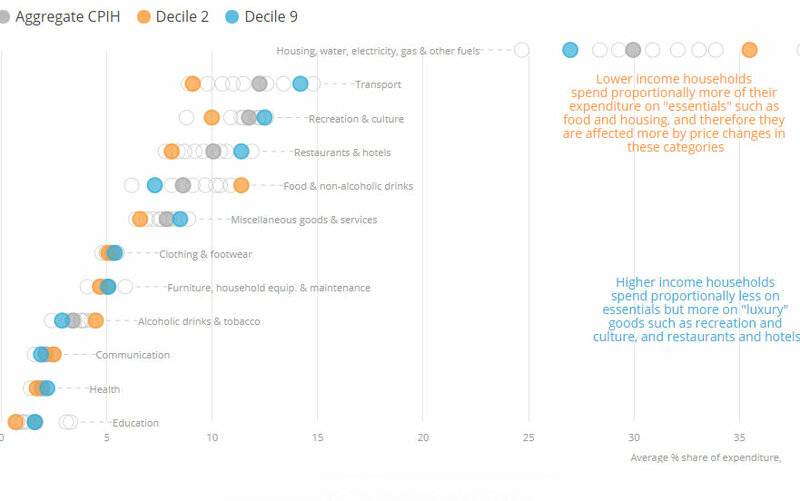 We know that those on low incomes and high incomes tend to buy very different ‘baskets’ of goods and services. We think that policy should be informed by a reliable regular measure of the inflation rate experienced by those on low incomes. This project represents a vital opportunity, working with the latest data, to make these insights accessible and help that policymakers pay attention. Here at Nottingham Civic Exchange, we believe that having a more nuanced understanding of different societal groups allows for clearer policymaking. By exploring the impact of these different inflation measures, we will be able to understand how changes to the economy at a national level affects different parts of our society. This project will begin and end with visits to the RSA in London where the project team will explore how their research can be translated and shared in effective and engaging ways. Jonathan Schifferes and Tom Harrison from the RSA will work with us and our students through this project to ensure the research is presented in ways that can be understood and utilised by key stakeholders. This will ensure Breadline Inflation creates meaningful new knowledge that can be understood and used by the various key organisations and communities who are impacted by this issue helping us to tackle economic insecurity and develop policy that is going to make a difference to citizens of the UK. To keep up to date with this work and to find out more please contact Rich Pickford at Nottingham Civic Exchange or follow us on Twitter where we will be sharing findings through #breadlineinflation.